The German Tennis Federation (DTB) suspends Dustin Brown, Mischa Zverev and Tobias Kamke for Davis Cup competition in 2017. According to a statement by Dirk Hordorff, Vice –President at the DTB, in “Süddeutschen Zeitung” Dustin Brown, Mischa Zverev and Tobias Kamke have been suspended for the 2017 Davis Cup competition. Allegedly the 3 players have been suspended because they refused to play in the relegation playoff match versus Poland this weekend. Instead, they rather want to compete in ATP Challenger events this week in Stettin (Poland) and Istanbul (Turkey) respectively. “They are picking out raisins if they want to play in more attractive 1st round matchups but then don’t want to play in less attractive relegation matchups. We want players on the team who want to play for Germany”. The DTB also announced a 2-year contract extension for the German Davis Cup coach Michael Kohlmann. Hordorff went on saying:“We have a lot of faith in Michael Kohlmann. We want to send a signal, especially to those players who have voiced their critical opinion internally and in the media, that we fully support Michael Kohlmann”. In a previous tweet Brown said: “If I’m not 100% fit and lose at a Challenger event then that’s a risk I take personally. But if I’m not 100% fit and play a Davis Cup match then Germany could lose, which is something I don’t want…therefore I informed the DTB that I cannot compete. I don’t understand why the DTB doesn’t communicate this appropriately. Its is also strange that some players, who at first claim to have issues with the choice of surface and time of play, all of a sudden refuse to play because they played to much tennis previously. In addition to that it would be wiser for the DTB to take things easy since they never supported me now or in the past. If I don’t stand up for myself who will? 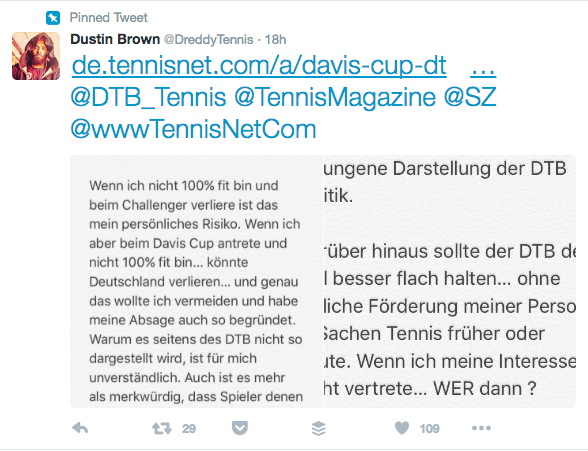 Dustin Brown went on tweeting: “If I had waited on the DTB then the tennis player Dustin Brown would not exist today”.